So over the weekend I got to work with the always talented Vanessa Rees on a food feature for Laika Magazine which I’m dying for you all to see when the next issue comes out. During the recipe testing for the almond vegan cheese recipe in the feature, I ended up with this rouge half a container of a fancy vegan coconut yogurt and following our philosophy that no ingredient should be left behind – we obviously had to use it in another recipe. 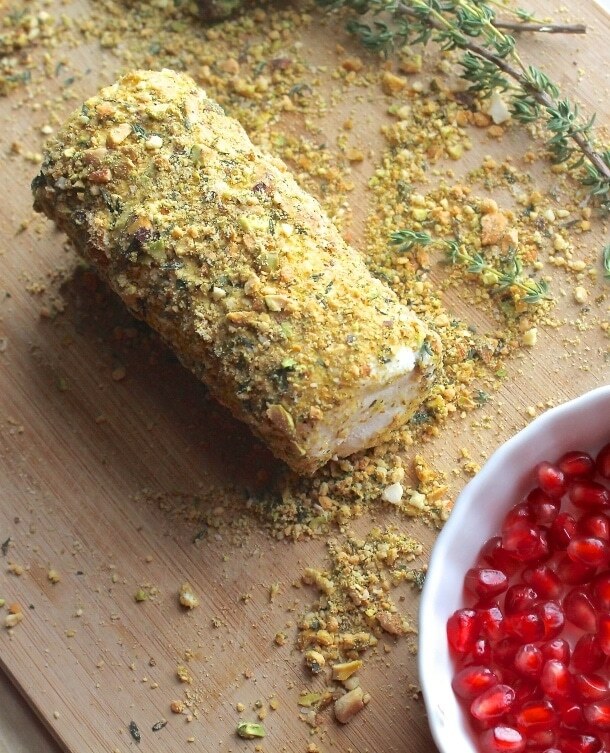 This recipe is inspired by a perfect storm of happenstance… first, there was this photo of a pistachio crusted cheese log* that I stumbled across awhile back when looking for inspiration for what to do with a bunch of leftover nuts. Then there was the aforementioned coconut yogurt. There was a comment Vanessa made while we were eating the tester cheeses… that the ones made with the coconut yogurt were sweet like a dessert cheese**. Then there was Dan saying that he wanted to eat vegan cashew cheese for dessert after I told him about Vanessa’s comment. So I made that happen. OK – So it’s not some supernatural origin story but sometimes the best stuff comes from humble beginnings and not Krypton. I’m super tired today so I admit this post lacks the usual tangents about TV shows, babies, travel, etc… but what it does offer is a DIY recipe for vegan cheese that anyone can make using some of the oldest tricks in the book that I hope you’ll try out and use to make your own vegan cheeses… dessert or otherwise. Drain and rinse your pre-soaked cashews. Line a 4 to 5″ mini springform pan*** with parchment paper. Leave the edges of the paper out to help you lift out your cheese round later. Toss all your ingredients except the agar agar and pistachios in your handy dandy food processor and blend until liquified. Pour your cheese mix into a saucepan. Whisk in your agar agar while heating your cheese mix over a medium heat. Once your cheese begins to bubble and is thick remove from heat and pour into your lined pan. Gently fold the edges over the top and put in the fridge to chill overnight. Right before serving, take your cheese out of the fridge, unsnap your springform pan and gently lift your cheese out while wrapped in the parchment paper. Crush your pistachios in a food processor until you have small chunks – but don’t turn it into dust. Pour your pistachios into a shallow dish. Unwrap your cheese. They should come out looking a lot like this. 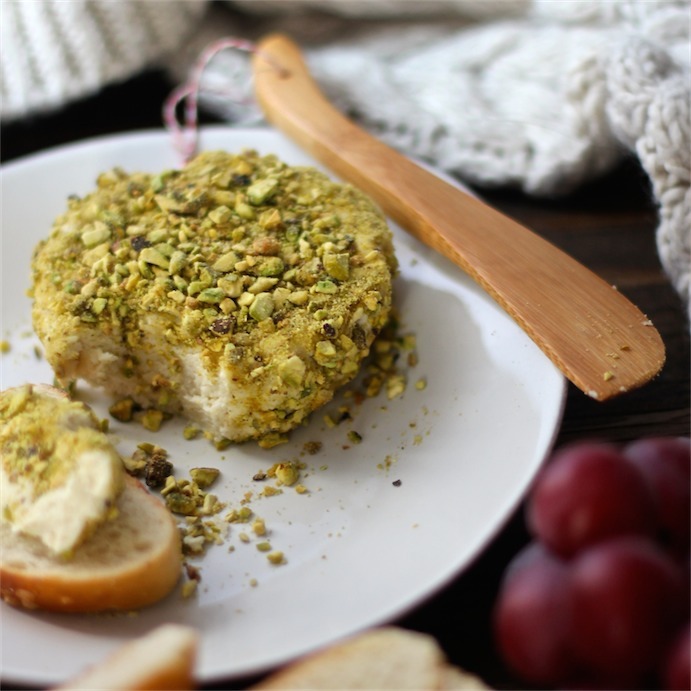 Carefully coat your cheese round in the crushed pistachios by rolling it in your dish and using your hands to press the larger pieces in. Serve at room temperature with slice of baguette bread or light crackers that would work with a sweet “dessert” cheese. * “Cheese Log” – Really can we think of a more unappetizing description? **Never heard of “Dessert Cheese?” It’s cool we’re all vegan or at least vegan friendly here and some of us have been out of the cheese game for a while now. According to Saveur Magazine dessert cheeses are “Soft, creamy and rich with a subtle tang to balance out the sweetness.” You can can have sweetened cheese like cheesecake or mascarpone or you can pair a tangy or salty cheese with a sweet fruit so that they bring out the flavors in each other. We combined this sweet cheese coated in kinda savory nuts with tangy red grapes to make an sort of unconventional take on “Dessert Cheeses” but we also used coconut and cashew instead of milk so I guess once we jumped outside the box we kept going. *** We also use these pans to make things like the mini pumpkin cheesecakes we serve on Thanksgiving.